If you read our various articles and news you probably see Object Desktop mentioned often. We still get lots of questions about what exactly Object Desktop is, and why a subscription to it should be considered over just purchasing a single product. Let me first start off by explaining that Object Desktop is a yearly subscription that contains many popular Stardock applications which we’ll cover in detail below. Subscribing gives you access to all the included applications, and as long as your subscription is current, you will receive any updates and new versions that are released. Being a subscriber also gives you the benefit of having early access to beta versions of software so you can check out the latest updates before it’s released to the public. You are also getting over $100 worth of software for just $49.99, and yearly renewals are just $34.99. You get a whole collection of desktop enhancement apps to both change the look of Windows and to help improve the functionality of it as well. You can download the individual apps from your Stardock account, or use our Object Desktop Manager to keep up-to-date with updates. The Object Desktop Manager is an application that can notify of any new updates available, and lets you download those updates or install any of the various components of Object Desktop which we will talk about more below. 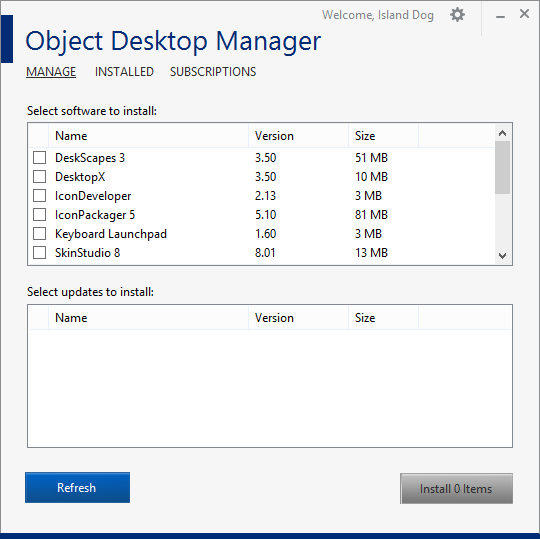 Once you have subscribed, you can download the Object Desktop Manager from your account. TIP: See a list of all the included apps here. Now we’ll cover the core applications included with Object Desktop, and a brief overview of what they do. WindowBlinds is one of our most popular pieces of software in Object Desktop, it has been around for many years, and has millions of downloads. WindowBlinds gives you the ability to completely change the look and feel of your Windows desktop by applying skins to the user interface. 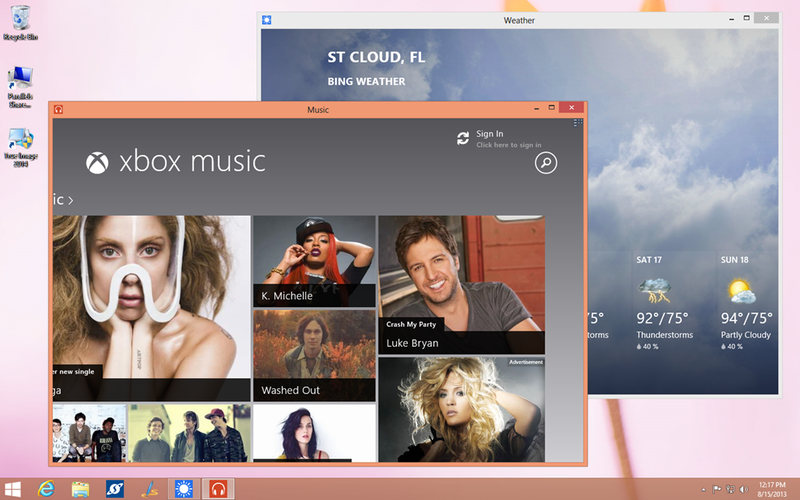 These skins will change the start menu, window frames, taskbar, and much more. Thousands of skins are available to download and there are styles to match just about every kind of taste. If you are running Windows 8 and are looking to bring back the look and functionality of the missing start button, then Start8 is what you’re looking for. 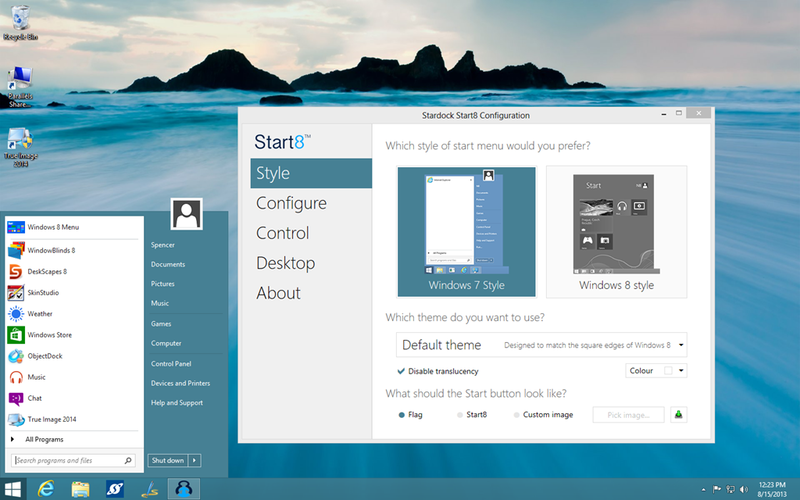 Start8 brings back the missing start menu along with many additional features such as boot straight to desktop, jump list support, customizable start buttons, and more. 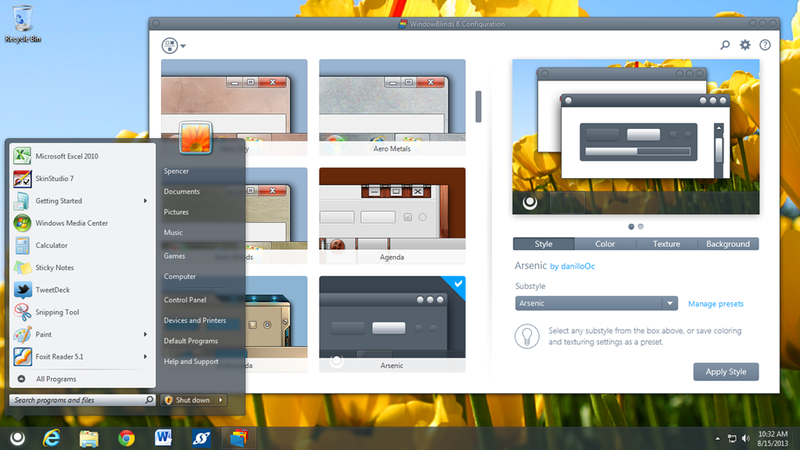 TIP: If you use Start8 with WindowBlinds, Start8 will inherit the skin used so it will match. 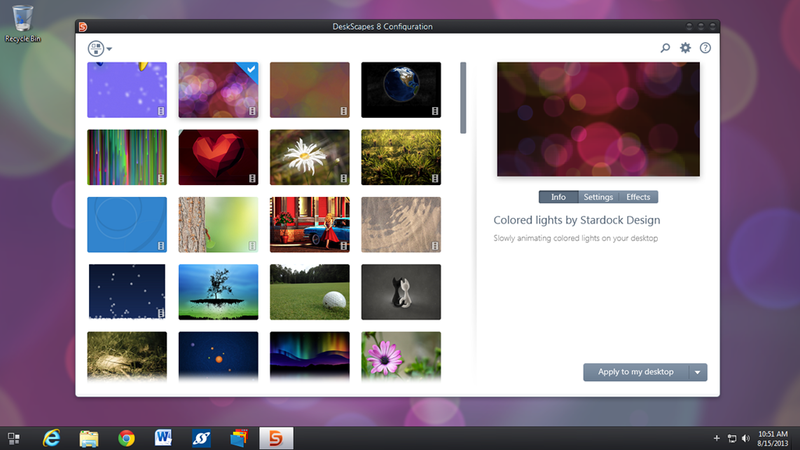 DeskScapes does lots of cool things, and the top feature would be putting animated wallpapers on the desktop. Whether you’re looking for a subtle landscape animation, or a 3D rendered animation of the solar system, there are Dreams (animated wallpapers) available. Not only does it apply both animated and static wallpapers, it also lets you apply effects to them giving you even more customization options. Fences is another popular desktop utility programs included with Object Desktop. Fences removes those messy, out-of-control icons on your desktop and lets you wrangle them into "fences" on your desktop. You can label, resize, and even create rules for these fences to keep your desktop clean and tidy. Additional features include, letting you create folder portals so you can have direct access to favorite folders right on your desktop. 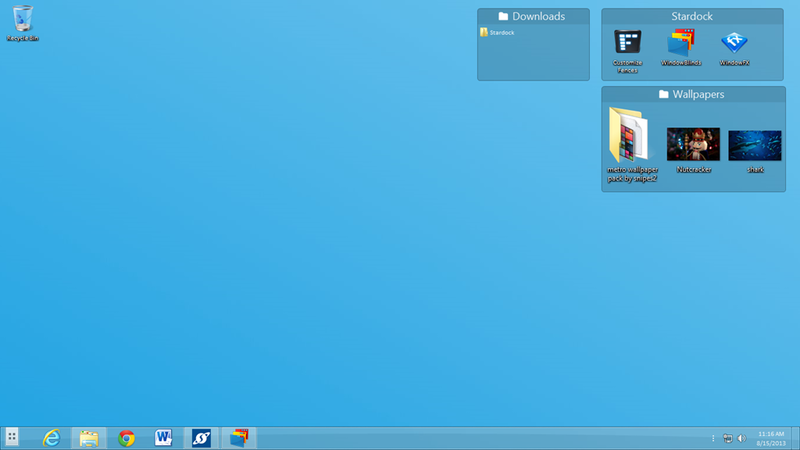 TIP: Double-click an empty space on the desktop and your icons and fences will disappear. Double-click again to bring back. WindowFX lets you add a bunch of cool effects to your desktop. Make the desktop windows wobble, assign them different animations for opening/closing, take control of window focusing, and more! 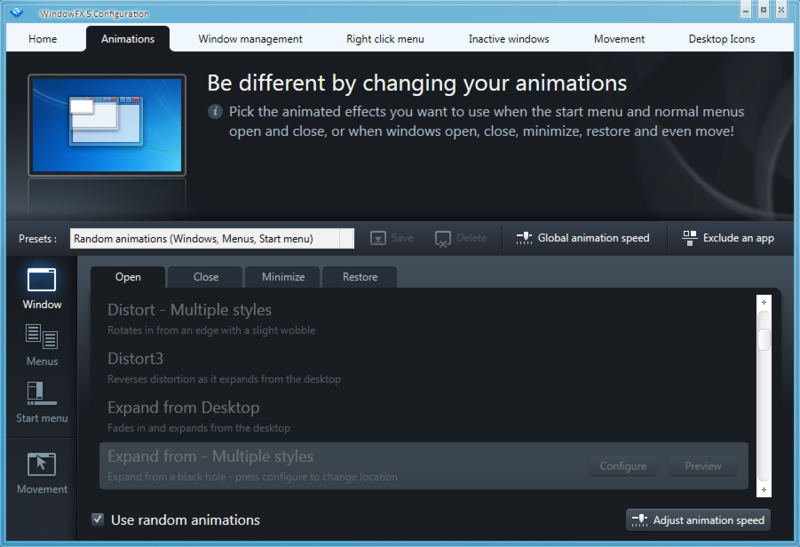 We have several demo videos on the WindowFX website to show exactly the neat things that WindowFX can do. Another app designed for Windows 8 users is ModernMix. If you have ever used a "Modern UI App" (Metro App) in Windows 8 you may have noticed that it’s full screen, which is pretty annoying for most apps. ModernMix lets you run those same apps in a window on your desktop, just like do with regular desktop software. 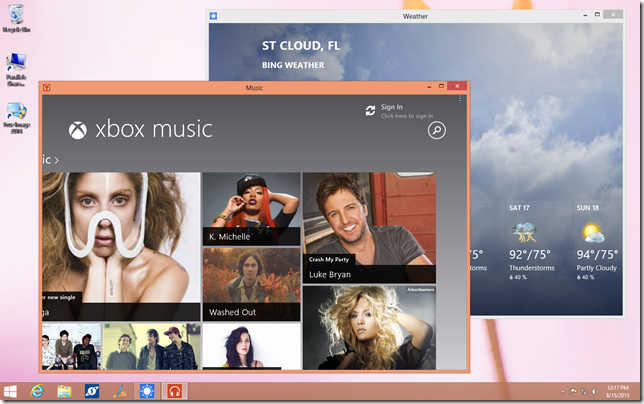 These are just several of the popular apps included with your Object Desktop subscription. You get many other applications like IconPackager, IconDeveloper, Tweak7, Keyboard Launchpad, and several more. If you want total control over the way Windows looks and functions, then you can’t go wrong with an Object Desktop subscription. 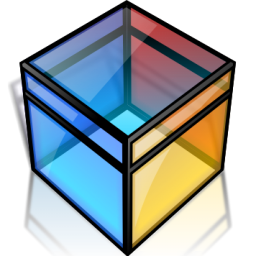 WindowBlinds is one of our most popular pieces of software in Object Desktop, it has been around for many years, and has millions of downloadeds. Nice article, Spencer! Yes, Object Desktop Subscription is THE way to go! No brainer - best way to go. And I don't (yet) use Win8. Must be middle of night in Oz.